Adaptive optics (AO) is a mature technology that allows obtaining improved images by correcting the optical aberrations of the instrument. Perhaps the most well known AO application is in astronomical telescopes to compensate for the image degradation induced by the atmosphere. Although with different spatial and temporal scales, the optical problems involved in the human eye are similar as those in Astronomy. During nearly 20 years, different laboratories in the world, including my own lab1 devoted significant efforts to develop adaptive optics instruments for use in Vision and Ophthalmology. The human eye is a simple, but extremely robust, optical instrument2. It is composed of only two positive lenses, the cornea and the crystalline lens, which produce real images of the world on the retina, initiating the visual process. When compared with artificial optical systems, often formed by many more lenses, the eye is simple, but well adapted to the requirements of the visual system. The optical surfaces of the eye’s lenses are not exactly spherical in shape and they are not perfectly aligned, producing ocular aberrations and blurring the images on the retina. The impact of the aberrations in a normal eye is approximately equivalent to that of 0.25 D of pure defocus, a small error typically not corrected, although this can be quite significant when imaging the retina. In the normal young eye, the optical properties of the two ocular components are tuned to produce an improved overall image quality. In particular, two of the most important aberrations, coma and spherical aberration are partially corrected in the eye, in a similar way as in an aplanatic optical system3. When the eye’s optical aberrations are known, it is possible to correct them using a wavefront correcting device that compensates for the eye’s aberrations. In the ideal case, the system of “corrector+eye” becomes aberration-free, producing perfect (diffraction-limited) retinal images. AO in the eye can be implemented using deformable mirrors or liquid crystal spatial light modulators as corrector devices4,5. The main application in the early days of AO for the eye was to improve the resolution and quality of retinal fundus images recorded through the corrected eye optics in ophthalmoscopes. However, once AO instruments were operative for the eye, we realized that not only ocular aberrations could be corrected, but also any desired aberration pattern could be added to the eye in a controlled manner. By using an additional optical path, visual stimuli were projected to the eye’s subject to perform visual testing for a variety of optical conditions. This is the basis of the concept of the adaptive optics vision simulator. This instrument consists of a wavefront sensor to measure the eye’s aberrations and a correcting device, in our more recent choice a liquid crystal on silicon (LCOS) spatial light modulator, to modify the eye’s optics. A Hartmann-Shack (H-S) wavefront sensor6 operating in infrared light measures the eye's aberrations and residual defocus in real time (25 Hz). In the second pass, after the light is reflected in the retina and passes through the complete system, an array of lenslets, optically conjugated with the subject's pupil plane, produces an image of spots on a camera. The locations of the spots provide the local slopes of the ocular wavefront aberration. 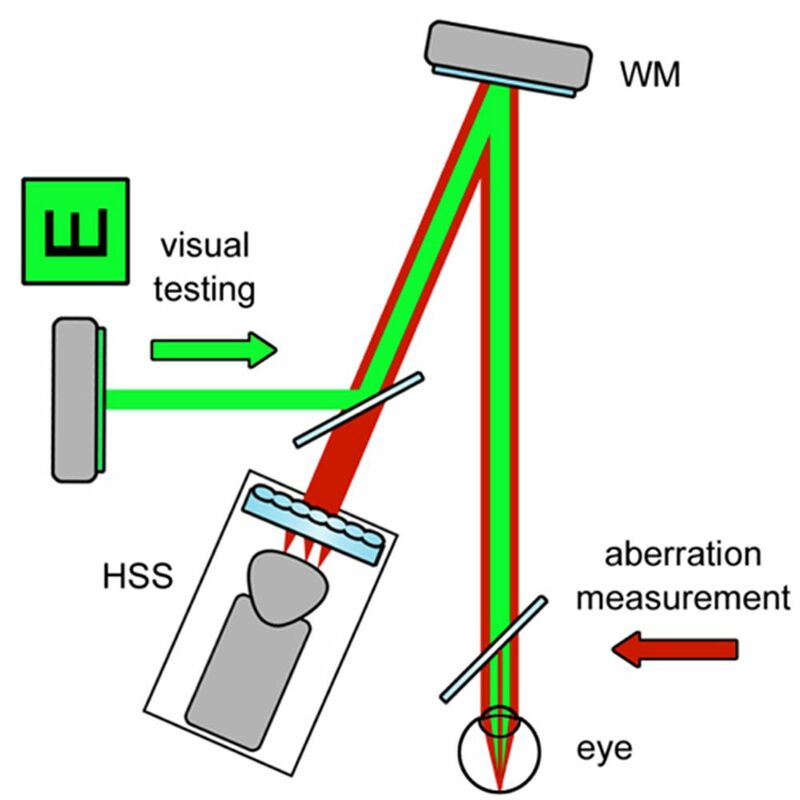 The correcting/manipulating device is placed in the system conjugated both with the subject's pupil plane and the wavefront sensor, by using appropriate sets of lenses in a telescope configuration. Subjects view a stimulus (letters or any visual scene) produced either by a pico-projector or an OLED micro-display. Figures 1 and 2 show a schematic diagram of the instrument and a picture of a commercial version developed by Voptica SL (www.voptica.com), a start-up company of the University of Murcia. Figure 1. Schematics of an AO vision simulator, showing the main elements: spatial light modulator, H-S sensor and micro-display. Figure 2. Picture of the first commercially available clinical version of an AO vision simulator by Voptica. The potential applications of this type of AO instruments in Ophthalmology can be enormous. Perhaps the most obvious is the progressive substitutions of phoropters, those old-fashion systems that you find in any ophthalmic clinic, containing wheels with different lenses used during visual testing to determine the required optical prescription. With AO not only defocus and astigmatism, but all optical aberrations could be induced. 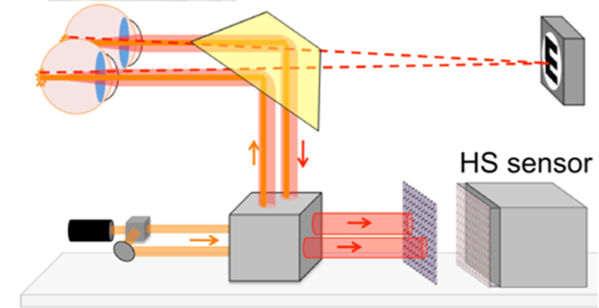 This would allow optimizing the optical correction for different visual tasks and conditions. For example, in some cases, some residual customized amount of spherical aberration can provide depth of focus in presbyopic eyes. Another powerful application will be the pre-testing of different optical solutions. In invasive procedures, such as laser refractive surgery, before a definitive ablation of the cornea is performed, the optical profile to be induced could be optimized for each patient. This will open the door to an era of true customized eye treatments. In vision research, a variety of experiments can be performed with this instrument. Just as an example, we explained the underlying reasons of the phenomenon known as night myopia7, the myopic shift occurring at low luminance levels that is mainly due to an error in the eye’s accommodation. The future of this technology looks really promising and I personally expect a rapid transition from the laboratories to the clinics. However, there are still challenges that need substantial work to be carried out. Although we have already proposed binocular AO systems8, they are still limited to the laboratory. In addition, open view systems combining AO and eye–tracker technology should be developed for more practical clinical uses. We have recently developed a multi-signal sensor operating in open view (Figure 3), although the compensations part is not yet implemented9. I am convinced that these tools will revolutionize the way vision is tested and corrected today. In addition, this will offer patients the possibility to evaluate vision before a surgery and to surely optimize the clinical outcomes. As a final comment, I would like to emphasize that this is an example of a technology originated in academic laboratories that will eventually emerge as an indispensable clinical tool to improve the quality of vision of patients. Figure 3. Schematics of an open-view binocular sensor. E. J. Fernández, I. Iglesias, and P. Artal, “Closed-loop adaptive optics in the human eye,” Opt. Lett. 26, 746-748 (2001). P. Artal, A. Benito, and J. Tabernero, "The human eye is an example of robust optical design," J. Vis. 6, 1-7 (2006). P. Artal and J. Tabernero, "The eye’s aplanatic answer," Nature Photonics 2, 586-589 (2008). J. Liang, D. R. Williams, and D. T. Miller, “Supernormal vision and high-resolution retinal imaging through adaptive optics,” J. Opt. Soc. Am. A 14, 2884-2892 (1997). P. M. Prieto, E. J. Fernández, S. Manzanera, and P. Artal, “Adaptive Optics with a programmable phase modulator: applications in the human eye,” Opt. Express 12, 4059-4071 (2004). P. M. Prieto, F. Vargas-Martín, S. Goelz, and P. Artal, “Analysis of the performance of the Hartmann–Shack sensor in the human eye,” J. Opt. Soc. Am. A 17, 1388–1398 (2000). E. J. Fernández, P. M. Prieto, P. Artal, "Binocular adaptive optics visual simulator,"
Opt. Lett. 34, 2628-2630 (2009). E. Chirre, P.Prieto, and P. Artal, "Dynamics of the near response under natural viewing conditions with an open-view sensor," Biomed. Opt. Express 6, 4200-4211 (2015). 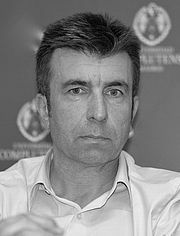 Pablo Artal developed new optical approaches to better understand the optical properties of the human eye. His first contribution was a new double-pass instrument, using a laser source to illuminate the eye and a camera for recording the retinal image. 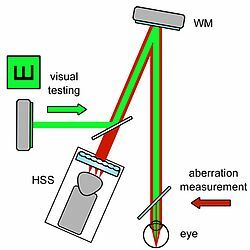 The analysis of the images provided with new insights into the eye’s optics and more importantly opened the door for the use of new technology in other apparatus, notably the Hartmann-Shack wavefront sensor. This early research led to the aberrometers, of common use today in Ophthalmology. Artal and his co-workers used innovative laboratory prototypes to discover that the cornea and the lens present a coupling of the aberrations that improve the retinal image quality. They showed that the eye behaves optically as an aplanatic system, with a partial correction of spherical aberration and coma. They also found that the eye’s aberrations increased with age and the reason was actually a decoupling between the cornea and the lens with age. These findings were used as the theoretical bases for the new generation of aspheric intraocular lenses now widely used in the clinic. The first adaptive optics system to correct for the eye’s aberration in real-time was also developed in Artal’s laboratory. These concepts were applied later for the first time for visual testing as adaptive optics vision simulators. A plethora of new applications has from them transformed vision correction, providing new ways to image the retina and to evaluate vision. The first recording of the eye’s points spread function using a double-pass instrument. This experimental system was later transformed in a clinical instrument able to detect cataract and analyze eye’s image quality. The discovery that the aberrations of the lens partially compensate those of the cornea. This explained a long-standing paradox that patients with intraocular lenses do not have better image quality, and lead to the invention of aspheric intraocular lenses now widely used in cataract surgery. The discovery that the young eye is an aplanatic system with a natural mechanism to correct spherical aberration and coma. The discovery that adaptation in the neural visual system compensates for the particular pattern of higher order aberrations in the eye. First evidence that cone photoreceptors could be imaged in the living eye by using a method called speckle interferometry. This was the precursor of new the new systems for high resolution imaging of the retina. First proposal and implementation of the concept of adaptive optics visual simulator. This is a system that permits visual testing under any controlled eye’s optics. Different versions of this instrument have been used to design improved ophthalmic solutions and are nowadays in development for future electro-optical phoropters. A binocular version has been also demonstrated. Determining the optical characteristics on the peripheral retina in normal and pseudophakic eyes. Development of new optical instruments for the precise evaluation of the amount of scattered light in the human eye. Deciphering the causes of the phenomenon of night myopia. A new intraocular mini-telescope for patients with macular degeneration. Hundreds of the clinical instruments based in the double-pass technique developed by Artal are used worldwide (OQAS and HD-Analyzer by Visiometrics). Thousands of automated wavefront sensors operate in ophthalmology clinics worldwide improving vision correction methods for patients were developed based in earlier research. Millions of new intraocular lenses that mimic the natural optical properties of the young eye, as suggested by Artal and co-workers, have been implanted in patients. More recently, he co-invented an intraocular mini-telescope to improve vision in patients with macular degeneration. The use of adaptive optics visual simulators will eventually change the way eye’s refraction is performed, probably rendering the traditional instruments to evaluate vision (called phoropters) obsolete. He and his team were the first to implement in the laboratory a closed-loop adaptive optics system, able to measure and correct the eye’s optical defect. Although this technology may have a large impact in ophthalmology and vision research, one of the main limitations was the elevated cost of the components. They developed systems using relatively low cost components. He was the first to introduce liquid crystal spatial modulator devices in ophthalmic adaptive optics instruments. He is still working in that direction and the prototype of electro-optical phoropter may change the form that vision is tested. 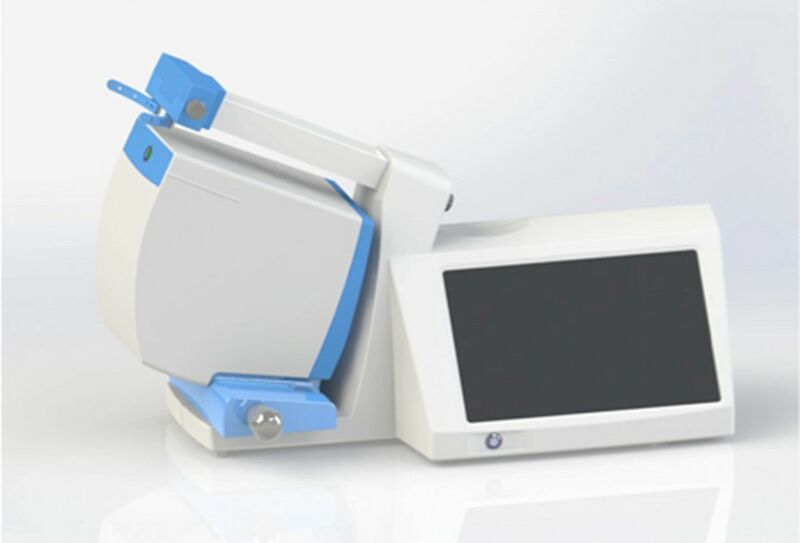 A commercial clinical instrument (Voptica) is already in the market. The development of technologies for imaging through the turbid media of the cataractous eyes. There are two direct applications of this technology: a dedicated fundus camera to register images of the retina in patients affected by cataracts and a novel type of opto-electronics spectacles restoring some vision in cataract patients. The fundus camera would offer clinicians the unique opportunity to determine if there is any retinal pathology underneath the cataractous eye. The scattering-correcting goggles would be useful in those cases where surgery were not possible for any reason or as a temporarily relieve until the surgery is performed. Prof. Artal’s personal blog (pabloartal.blogspot.com) covers aspects on ethics and science or career development for young scientist.